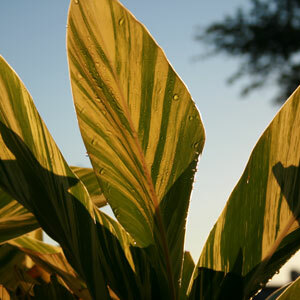 Alpinia zerumbet ‘Variegata’ will show the best foliage color in partial sun or slightly shady conditions. Variegated Shell Ginger will flower after the second year if it does not freeze back in the winter. The flowers droop in sprays starting as waxy white or ivory buds, opening one at a time to reveal yellow lips with pink or red marked throats.This clump forming perennial can grow to be as much as 6 feet tall with a spread of 5 to 10 feet. This plant has long, densely massed stems with broad, green leaves. The foliage of Variegated Shell Ginger is green with yellow variegation or stripes and is a great accent plant to highlight a dark area.